"We are back from a long trip to Dayton. We have the TYT Dual Band Mobile now (This was displayed at Dayton Hamvention) I will be taking pictures of it in the morning and then its going back to TYT in China. Thank you TYT for letting us have this to show at Dayton. (TYT was happy to supply the Dual band Mobile, Wouxun was not interested in having theirs on display ???)" I'm not sure which specific model he is referring to when he says the "TYT Dual Band Mobile." I thought the TH-9000 was a single band radio. The TYT TH-9800 is supposed to be the quad band mobile. He mentions it below. I need to finish my post about the TH-9800. I spent a few minutes looking and didn't see the dual-band pictures on his site either. I thought there might be some news from Ed about the Wouxun KG-UV920R - I was predicting that he would have a demo unit. Based on the current chatter (here and here), no response from Ed (to his credit he is usually really good about engaging with the on-line community), and comments like the above, maybe we should be looking at TYT or Vero for the amazing value in mobile rigs. 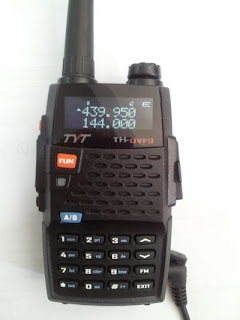 "We also had the New TYT Th-UVF9 4 watt HT. Ed and I both have one and testing it now. This will be available within a couple weeks. I will post detailed pictures of it on this site in the morning. I will also post the New Specs for the TYT mobile too on the catalog page. They added AM receive coverage for the Air Band. This F9 HT does have the dot matrix readout." Air band. Cool. Dot matrix readout. Also cool. I don't see the pictures and specs on the catalog page. Maybe I need some glasses or more coffee. "TYT DUAL BAND MOBILE expected to ship in October. This is the mobile to watch for ... its actually a Quad Band Mobile covering 10, 6, 144 and 440. The other Chinese mobiles are only 144 and 440. Those of you that have waited for the Wouxun mobile should wait for the TYT first before buying one." Earlier in the month, Nate pointed out in the comments that there could be some photoshop action going on in the TYT TH-9800 Dual/Quad band - a Yaesu FT-8800R screen? It doesn't mean the radio is fake by any stretch as I can image the marketing designer grabbing something convenient to complete the image. At least there is hard date for availability - October. I'll keep looking and see if he posts any additional information. TH-8900, TH-9000 and TH-9800 share the same FCC ID: X24-MOBILE-U (for UHF) and X24-MOBILE-V (for VHF). Granted earlier this month.